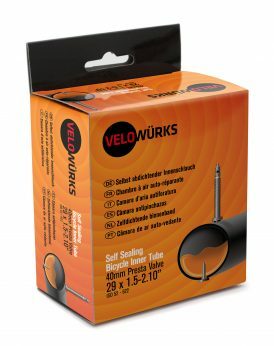 Velowürks self sealing inner tubes are treated with our exclusive eco-friendly sealant to seal punctures up to 3mm in the tread area instantly to keep you rolling. And, Velowurks sealant stays liquid and viable to seal punctures again and again for up to 2 years. Plus, our eco-friendly sealant is harmless to humans, pets and the environment. This entry was posted in Tubes, Velowurks and tagged Bicycle, bike, Bike path, Commuter, flat tire, Flat tire repair, no flats, Self sealing inner tube, Urban on September 1, 2013 by Marlow.